Evergreen Maidenhair Fern Adiantum venustum is one of the most attractive deciduous ferns for shade gardens in my opinion. In mild climates Maidenhair ferns can be evergreen most of the year but can also be deciduous, turning to a rust brown autumn and winter colour. This fern species spreads through thin rhizomes to form a beautiful groundcover approximately 25cm high. 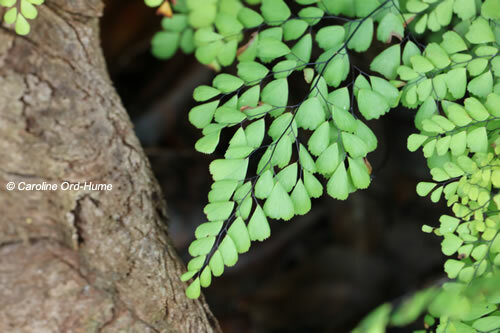 The fronds have an ovate shape made up of fan shaped parts set on dark to black shine stems. It’s an attractive fern plant that really does set off shade areas of the garden, and looks particularly beautiful when growing near water. Evergreen Maidenhair ferns are good for under planting in cottage gardens and informal garden areas of shade or semi shade such as under trees, shrubs, bushes, roses, and flower borders. Maidenhair fern plants are low maintenance. Grow in partial shade or full shade facing south, west, or east, in sheltered or exposed places. Grow outdoors in a moderately fertile soil with a success preference for filtered light, good ventilation, with humidity at high or medium. During the growth season you can feed with a liquid fertiliser at half strength once a month. Remove damaged fronds in spring. 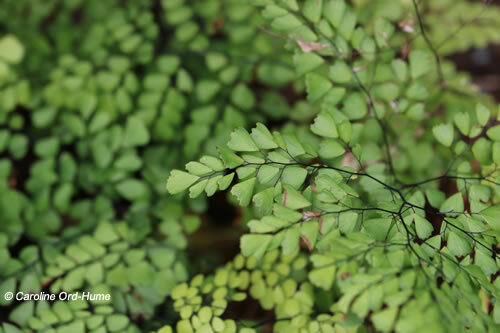 Maidenhair ferns do not require pruning but fronds that are damaged can be removed in the spring. Propagation takes place through spores. Plants can be transplanted in spring. Maidenhair ferns are generally free of disease.